AvatarSpirit.Net > The World of Avatar > Avatar: The Last Airbender (Moderator: Zubby) > Azula and Evil... Redemption? Question: Is Azula capable of redemption and if so, will it happen? I have no idea what to think anymore after seeing "The Beach." Azula herself thinks she's a monster, and yet here we saw her attempt to do some not-so-monstrous things. I... just don't know, now. Sociopaths often aren't self-delusional the way people with other types of mental illnesses can be; particularly those as highly intelligent as Azula seems to be. Azula's attempts at flirting were kind of funny, though. Were I in that guy's place, and she didn't terrify me so much, her line about DOMINATING THE EARTH might've done it for me, personally. That poor guy just wasn't ready for it, though, lol. "Toby Flenderson is everything that's wrong with the paper business." What did you all think of Azula's first kiss? ^ It was quicker than I thought it would be, but thats probably because it didnt have any deeper meaning to it. Though after watching the beach, its nice to know she has a "human" side. And to that, a hilarious embarrassing one. I think she showed her sociopathic tendencies. She tried to connect with a boy - really the first boy in her line of sight - as if "must experiment with this". She was hilariously inept. She played volley ball and cackled about destroying her opponents. She's socially out of synch with how normal (non-monstrous) people think and act which was funny, but I wouldn't say it disproves that she's a monster. She managed to manipulate the emotions of all three of the others in that beach scene and at the end she was the ring leader went they went on their rampage. I guess the fact that she could admit to being jealous of Ty Lee showed Azula is something more than one dimensional evil. Knowing that she was hurt that her mother thought she was a monster doesn't really change the fact that she is a monster. Keeper of Zuko's formerly buff physique. Keeper of Sokka's "The Universe just loves proving me wrong!" Azula totally wins season 3 so far. Man oh man, where to start? In the first two episodes, we see the scheming, evil Azula at its best. This girl is definately has a big role to fulfill this season, probably even bigger than Ozai, and its not going to be good for the Gaang. 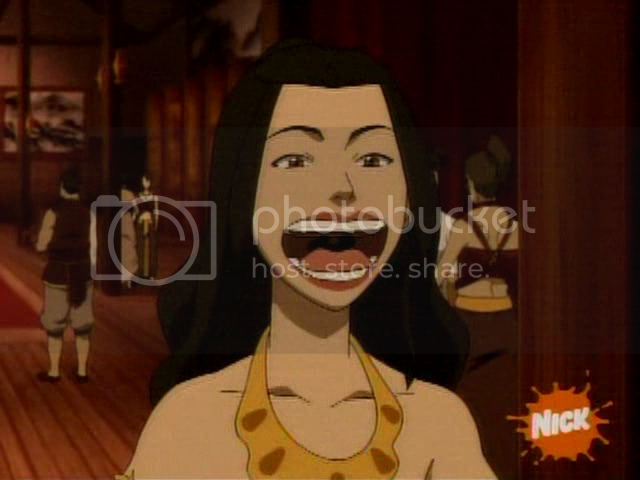 The Beach definately showed a whole new side of Azula. Its no coincidence we see Azula's desperate attempts to flirt in a sob-story episode. In this episode, Azula was mainly comic relief, which is totally absurd when you think about it. Did anyone think that Azula, of all people, could serve as comic relief when they finished season 2? I dont think so. Oh man, Azula just climbed the favorite-ladder character almost all the way to the top. She and Iroh will have to compete for the place of "Favorite Fire Nation Citizen" on my top list. I think she showed her sociopathic tendencies. Azula isn't a sociopath (technically known as antisocial personality disorder). Sociopaths don't really feel anything...for example, in tests where electrical shocks are given when answers are incorrectly given, sociopaths show almost no ability to learn the right answer...the stimulation of the electric shock just doesn't mean anything to them. There's far more we could go into to show that Azula isn't a sociopath, but this is the key point and it clearly disproves any notion that Azula is a sociopath. Azula may enjoy others pain, but...well that's just it: She enjoys it. A sociopath wouldn't. Azula clearly has emotions (very much so in fact), and she is clearly able to plan well ahead (something sociopaths are not). Well, the Beach definetly showed the best of her, the normal not evil part. In fact I kind of felt identified with Azula, because I'm not good with socializing with people and I don't get guys attention. But well I'm sure she won't change in one episode and will probably continue playing with Zuzu's tormented mind. Keeper of the Iroh's love for Lu Ten, Lt. Jee's smile, Jeong Jeong's wisdom and Zhao's evil smile. Citizen of the Fire Nation capitol. Yeah, I'm not generally good at those kind of social events, either... though in my case I can't really get any female's attention. Partially for that reason, I suppose, this was the first episode which I haven't completely despised Azula. I have no delusion that she'll be redeemed, of course, as she seems to be too far gone. But it's still nice to know there's a part of her in there that's still a little bit human. The True Fire Lord will rise up! Is Azula human (that is, can she be "redeemed")? I remember now that Azula is only 14 but acts a lot older. This got me thinking: I wonder if Azula could be redeemed? Look at the first Avatar episode. No one would've ever thought Zuko redeemble until late Season 1, and look at him and Iroh now (incredible redemption potential) Anyways, send a message on what you think. I personally am not sure what to think yet. Rememeber, almost every Avatar character is "marvelously flawed" and is one hidden points of the show. Re: Is Azula human (that is, can she be "redeemed")? Don't we have a bunch of threads like this Already? Is Azula human (that is, can she be "redeemed")? merged into Azula and Evil, because it's basically the same topic. No No No, I don't think so. We already have Zuko who is going to be redemed. For Azula to all of a sudden get a heart, and say "I am so sorry, I regret everything I have done" and sob all over the place. I don't think you will ever see that. At the very least, if Azula is redemed, it will be in death. I even doubt that, but that is more likely, than Azula to be redemed and still be alive. Either she will end up a dead redemed person or alive still evil person. But most likely a dead evil person. No, i seriously I don't think shes going die. I mean if Zuko has take the place of a person who is going to be redeemed, dont we already have Zhao as the evil person who losses his life because he is beyond redemption. This Nickelodeon remember, there is now way they are going to have a 14 year-old girl die (even if it Azula). I mean how? Another spirit attack? Aang doesn't kill people. Im not saying shes going to be all nice and lovable, she can still be mean in the end - just not evil, imprisoned or dead. Maybe resentful for being defeated but not the ongoing antagonist. "The Beach" has proven to me beyond the shadow of a doubt that the Avatar creators are following closely to their biggest influence, Hayao Miyazaki, whose anime and manga works have always been populated with grey characters, as opposed clear black and white. This is a more realistic approach, leading to more developed and interesting characters, which is one of Avatar's biggest draws. Will Azula be redeemed? Perhaps. Although the events of "The Beach" will not change her in any permanent fashion, it showed her "human" side. I think it's even more unlikely now that she will be killed, least of all by her brother. I liked Azula after season two because she killed her opponent the first chance she got unlike other bad guys where they all have their chance but wait and untimely fail. But after the beach i like her even more because now i know she is not just a monster, she is a monster with feelings. lol. Her and iroh are my top two faveorite characters. I'm curious on where you heard this from because people with antisocial personality disorder can most definitely have emotions. There are a few people on these boards who are, for reasons I don't understand in the slightest, ABSOLUTELY CONVINCED that Azula cannot be a sociopath. This, despite the fact that she is a textbook case (the textbook being the DSM-IV). Are you a wordbender? Try this: Avatar Crossword #3: "Warrior of the Southern Water Tribe"
That's exactly why I asked actually. My gf is child therapist (trainee really) and as such has the DSM-IV. I've thumbed through it a few times and although I'm no expert (far from it) I just don't recall reading some of the things that have been said here. That's exactly why I asked actually. My gf is child therapist (trainee really) and as such has the DSM-IV. In some thread -- but sadly, not this one -- someone posted the diagnostic criteria for antisocial personality disorder (sociopathy) and pointed out that Azula more than meets the criteria for this problem, with the exception that the DSM states diagnosis should not be made until 18 and Azula is only 14. This, however, ignores the fact that on Avatar the kids are way more capable than their stated ages would suggest they should be, so I think "diagnosing" Azula as if she were 18 is fine. My guess is that some folks are confusing sociopathy with psychopathy (lots of folks call Azula "psycho" in the non-technical sense of the word), or don't really understand what sociopathy is, or think that diagnosing mental illness is as cut-and-dried as diagnosing something like diabetes. I put it down to general lack of knowledge, and most posters are fine with it when real info is posted (like the DSM diagnosis I mentioned.) But there always seem to be a few who just refuse to accept even professional publications on the subject as valid. Not much to do about them except shrug and move on. Azula's a textbook sociopath according to the DSM-IV. A simple fact, but a few folks will still argue it. What can you do? After watching The Beach, I actually feel for Azula now. What I mean is that I want her to turn good. But she won't. I guess because she's still so young and has a chance to change. I honestly think Zuko will offer to save his sister just like he offered to save Zhao, but she will refuse his help. It's just sad when you see how someone turns into a bad seed. It all starts somewhere, ya know? I think there is symbolism in the fact that Zuko, Mai, and Ty Lee admitted to their demons and thus had a sense of calm around them....but Azula refused to deal with her own emotions and so she stayed where she was. Azula ain't gonna make it, guys. I thought I'd be happy to see her go down. But now....I think I'll feel a little sad when she does. 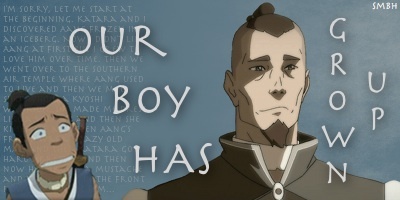 Zuko will too, no doubt. Well no kidding she can't change. It's part of her mental disorder. She can't just rearrange her mind and adopt emotions suddenly after playing volleyball. Very learned adults that watch the show with me confirm that she shows many sociopathic traits along with other disorders and its not a simple matter of a change of priorities, like Zuko. I agree, the events of The Beach earned Azula a chance to be redemed like the Fire Nation as a whole, but she is not going to take that opportunity. But I hope it is not Zuko who offers her help, we already seen that with Zhao. Maybe Ursa, or even Mai or Ty Lee to be the one to offer Azula help and a chance to live and be redemed. After seeing Azula in the last episode, the joy of her downfall, is greatly less. She is going down, but I am not going to have the same glee as I would have after the fall of Ba Sing Se, and thinking "I can't wait till Azula gets hers". Not in a normal sense. As I said before, sociopaths (and psychopaths) have a hard time learning from negative experiences. Azula can clearly learn just fine, her problem is in what she values. She can plan well ahead in detail, and doesn't give in to frustration (she comes up with a clever plan instead). This is completely contrary to the definitions of antisocial personality disorder. And my source is my psych professor.